Firstly let’s look at the ‘why’s’ – why should they? In the long run, their future spouse will definitely thank you if they can tidy up and have some life-skills around the house. In the short term, a clean house is everyone’s responsibility, not just mum’s! Everybody lives there and should be expected to contribute. And just in case you need more motivation to get your kids started, learning to do a task, help out in the house, be relied upon by others in their family increases kids self confidence and their self esteem. Plus learning how to use the dishwasher, washing machine, wipe a bench is a life-skill and will certainly help them for when they leave home. Definitely make sure you start when they are young, even a one year old can help, and enjoy picking up a handful of toys. Make it fun: turn on some music, and dance and sing along as you all do the jobs. For younger kids add some imagination, make them a robot or a forklift that carries toys back to their place. Pick Up By Color -Call out a color and only items of that color can be put away until the next color is called. This is a great way to teach colors as the toys get put away. Age Game-Have everyone put away as many items as they are old. What's Missing?-Have a child pick up ten items and have the parent try to guess what is gone. Robot or forklift - Pretend the child is a robot. Wind him up in the back and then input instructions by pressing the make-believe buttons on his chest. Program the robot to set the table or take something downstairs. Three- and four-year-olds love this kind of interaction. 3. Make it predictable: pick a definite time of day, ie. Before dinner (hunger is motivating!) or every Saturday morning that everyone pitches in and does a clean up. 4. Break it down: saying ‘clean up your room’ well that is just too hard, looks too hard and kids will get distracted and do nothing, break it into steps, pick up the books – the clothes – make the bed or write a list and they can tick them off as they go. Have a job list or roster for the week. 5. For older kids, definitely tell them what you expect – when I ask you to take out the rubbish, I expect you to do it within 10 minutes. 6. Praise – talk about how nice it feels to walk into their tidy bedroom, the lounge room etc. 7. Use the word ‘when’, when we’ve tidied up you can turn on the computer, ride your bike, we can all go out…. 8. Set a timer for 7 minute intervals and ask kids to tidy up the lounge for ‘just 7 minutes’ place a basket in the lounge for anything that doesn’t belong and this gets put away later. Repeat for the verandah or kitchen. Make a start today and you will be pleasantly surprised out how your kids can and will contribute to help out the family and be responsible. 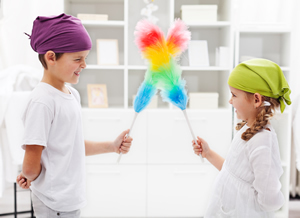 All kids should help with tidying and running of the house – after all, they live there too and it’s everyone’s responsibility not just Mum’s to keep things organized, clean and tidy. Not sure what jobs your child can do for what age? Well, here is a very broad list of ages and what they can do! Remember that all children are different – and this list is very broad! By age 15 most kids should be able to do everything you can do – whether they do it or not is a whole other story! Remember that you have more chance if getting a child to do their jobs if you help them up for the first few years. This gives them confidence and guidance. Once a child has become proficient at a job, it’s time to assign them a tougher task so they are always learning and growing. Encourage your children to do things without being asked, especially picking up toys or items that someone may trip over. Praise when you catch them doing just this – with out being asked. Be sure to teach safe practices from the start and be very careful when teaching them how to use the stove and microwave. Don’t give up and do it yourself just because it’s easier that way – teach your children early and you will reap the rewards later on. They will not magically become a teenager and decide it’s time to help out at home. It is a family’s job to keep a house neat and tidy – not just yours!